The solution is simple to quickly open Ease of Access Center in Windows 8.1 and Win 8! The fastest way to open Ease of Access Center in Windows 8.1 or 8 is via using the keyboard shortcut [Windows + U]! In the Ease of Access Center, you have quick access to many other commonly used tools: Magnifier, Start-Narrator, On-screen Keyboard and High contrast and other helpful tools! (... see Image-1 Arrow- 1 and 2). The full path of EaseOfAccessDialog.exe is C:\Windows\System32\EaseOfAccessDialog.exe, but a direct start via exe is not possible. This is a tool that enlarges part—or all—of your screen so you can see the words and images better. If it’s hard to read text on your screen because you need more color contrast, you can turn on high contrast. With Narrator, you can interact with your PC without a display by hearing audio descriptions of text, buttons, and videos on the screen. If you prefer to use your PC without using a keyboard, try using On-Screen Keyboard, a tool that lets you enter text by selecting characters on the screen. With Sticky Keys turned on, you won't have to press complicated key combos. For example, instead of pressing Ctrl+Alt+Del at the same time, you can press keys one at a time. Toggle Keys play a notification each time you press the Caps Lock, Num Lock, or Scroll Lock keys. These notifications can help prevent the frustration of inadvertently pressing a key and not realizing it. When you turn on Filter Keys, Windows ignores when you press the same key rapidly or when you press keys for several seconds unintentionally. Windows-8 - FAQ-149: How to open Quickly Ease of Access Center in Windows 8.1 and 10? How to open ease of access center in Windows 10? Windows 8.1 user ease of access locks? Ease of access windows 8.1? Windows 8 Ease of Access center? Windows 8.1 toggle ease of use? Disable Ease of Access on Windows 8.1 Laptop? How to access ease of access keyboard in win 8.1? Turn ease of access on win 8.1? How to turn off narrator in windows 8.1ease of access? 8.1 ease of Access Center? Ease of Access Windows 8? What is ease of access dialog on windows 8? Ease of access center disable for 8.1? Ease of access center windows 8? Where is ease of access on windows 8 without keyboard? Ease of access starts when using thunderbird windows 8? How to access software center in windows 7? Where is ease of use on 8.1? How to launch the ease of access centre? Windows 8 shortcut to ease of access? Ease of access center in Windows 8.1? Ease Of Access Center Windows 8.1? Windows 8.1 ease of access cant padd? 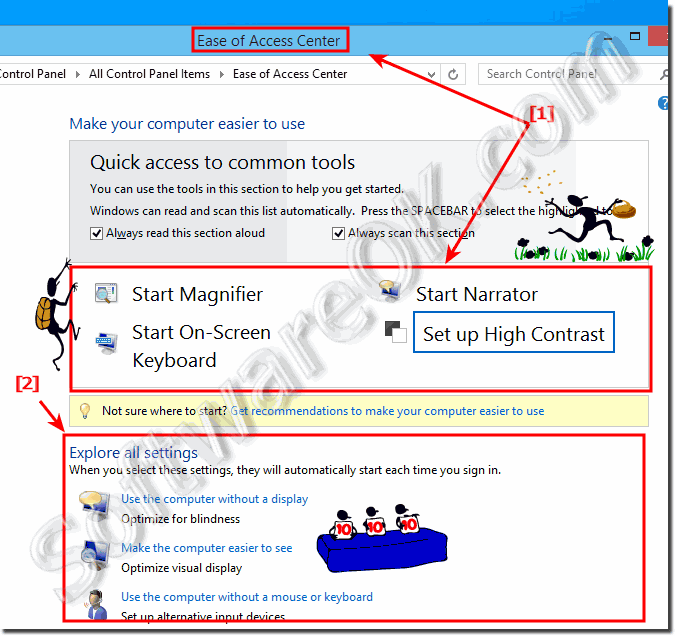 Ease of access center windows 8 how to open ease of access? How to launch ease of access centre? Launching easy of access centre un Win 10? Windows 8 remove ease of access ? Windows 8 1 ease of access center?